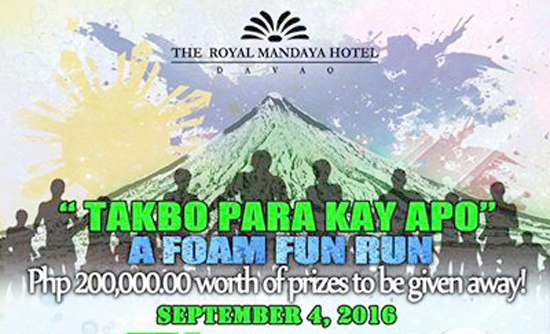 Hunat Dabaw, a yearly run for-a-cause organized by The Royal Mandaya Hotel is now on its fourth year. This year’s most anticipated run will be reeling in fun come September 4, 2016. Since its inception back in 2013, Hunat Dabaw has extended generous support to various entities and organizations as the activity’s beneficiary. This year, Hunat Dabaw’s proceeds will be used to help in the rehabilitation and restoration of the recently fire-stricken, Mt. Apo. Some will also be used to drive up information and awareness campaign on how to take care of our country’s heritage and on how devastating forest fires like this wouldn’t happen again. This year’s target will only be 2,500 participants from all three categories; this is to ensure safety and manageable flow of participants. 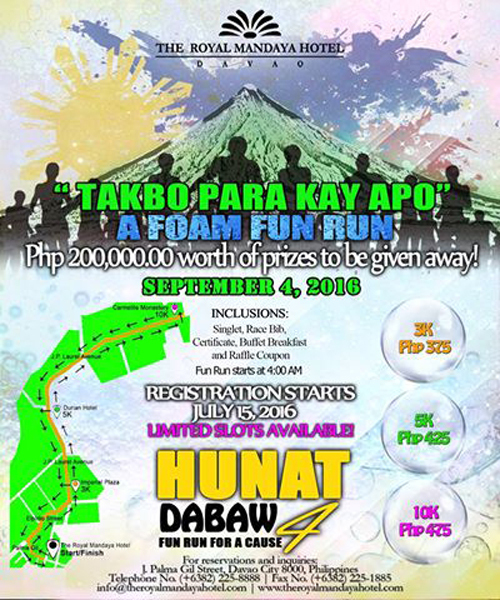 Hunat Dabaw isn’t just your usual boring fun run. This year will also be a foam fun run with P200,000.00 worth of prizes to be given away, yay! Can’t wait! Run Categories and registration fees are 3K (P375), 5K (P425) 10K (P475). Your registration fee include; Singlet, Race Bib, Certificate, Buffet Breakfast and Raffle Coupon. Fun Run starts 4am on September 4th. Race route will start from The Royal Mandaya Hotel to Carmelite Monastery in Lanang and back for the 10K category. Registration is accepted at these areas; Columbia Sports Apparel SM Ecoland, Gaisano Mall of Davao and NCCC Mall. For more details, call The Royal Mandaya Hotel, Palma Gil St., Davao City, or call; (082) 225-8888, (082) 225-1885.